Transfers to Les Allues are available from 3 different airports with Ben’s Bus. 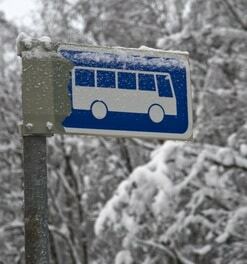 Our network of shared transfers include buses from Geneva Airport to Les Allues & Lyon Airport to Les Allues. From Grenoble Airport, our shared shuttles go as far as Moutiers, the village on the valley floor. Visit our Grenoble Airport to Moutiers page for tips on how to get from Moutiers to Les Allues. We run Les Allues airport transfers on week-ends (and Fridays from Lyon Airport) during the 2018 / 2019 ski season. Our shared transfers operate from 8th December 2018 – 20th April 2019, depending on which airport you use. We operate many shuttle buses each day and we generally transport passengers in large coaches, which means cheaper fares and less environmental impact. With our fantastic discounts for groups and Children, our prices start from just £73pp Return. Chambery Airport is the closest airport to Les Allues with the shortest transfer time, but it has a limited selection of flights. 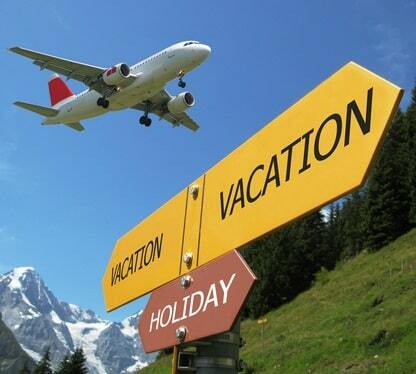 For a greater choice, consider flying into Geneva Airport, Lyon Airport or Grenoble Airport. The transfer time depends on the traffic and weather. We allow extra time for the journey when we know travelling conditions may be difficult, such as during the French school holidays. Les Allues is at the start of the Meribel valley road, the D90. Geneva Airport (GVA) is 125 km from Les Allues. The transfer time is about 2 hours 30 mins. A Return costs from £73pp. Lyon Airport (LYS) is 167 km from Les Allues. Our transfer time is about 2 hours 45 mins*. A Return costs from £85pp. Grenoble Airport (GNB) is 166 km from Les Allues. The transfer time to Moutiers is about 2 hours and costs from £66pp. Chambery Airport (CMF) is 96 km from Les Allues. The transfer time is usually under 2 hours. Moutiers Coach Station is 11 km from Les Allues. The transfer time is about 15 minutes. If you are arriving from Grenoble Airport or by eurostar, we’d recommend the local Les Allues public buses or a taxi for onward travel from Moutiers. *Our service from Lyon Airport will have a change of vehicle at Moutiers, where there may be a wait. Our team will help you with this. When you put your information into our Booking Form we will show the estimated wait time at Moutiers. 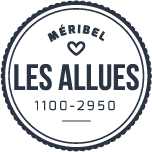 Les Allues is a small, authentic savoyarde village in the famous Meribel valley, part of the Les 3 Vallees. 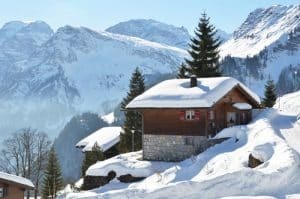 It sits at an altitude of 1100m and is actually the administrative centre of the Meribel valley. Its chalets, barns and narrow streets lend a distinctly mountain feel to the resort, which is popular with families. It is connected to the higher ski resorts and pistes via the “Telecabine de l’Olympe”, about 500m from the centre of the town. 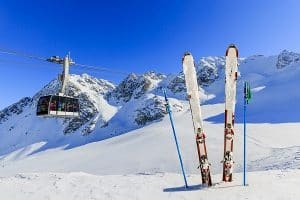 Les Allues offers an affordable way of experiencing the enormous 3 Valleys ski area which offers over 600km of marked runs and is serviced by 200 ski lifts. As well as 49 black runs, 175 reds, 207 blues and 66 greens, your 3 valley ski pass will allow you access to 2 glaciers, ensuring your ski holiday is snow-guaranteed. We believe we offer the cheapest Les Allues Airport Ski Transfers from Grenoble, Geneva and Lyon Airports. Snow Reports: The Les Allues snow-forecast website seems well trusted by skiers. Visit our Geneva Airport page or the official Geneva Airport website for more information about the airport itself. Visit our Lyon Airport page or the official Lyon Airport website for more information about the airport itself. Visit our Grenoble Airport page or the official Grenoble Airport website for more information about the airport itself. The Chambery Airport website can help you with information about the airport itself. Shared transfers are operated by Altibus.